Create a cute birds nest appetizer with Pesto, Goat Cheese, Cream Cheese, Thyme or Rosemary sprigs for Spring Brunch or Buffet. Herb speckled eggs shaped from the cream cheese mixture finishes the nest look, add assorted crackers around the nest. 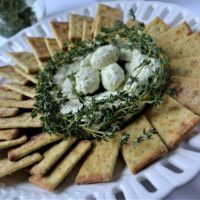 Pesto Goat Cheese Bird Nest is a quick and easy recipe that you will use for any entertaining occasion. Serve this cute appetizer on a Prissy Plate with or without decorative ribbon. To keep the presentation simple I did not use a ribbon on the plate. The plate is very versatile for entertaining events and will become one of your all time favorites and go to pieces. Served on a Prissy Plate with out ribbon, this appetizer is made with cream cheese, goat cheese, and pesto. Shaped into a round birds nest and lined with fresh thyme sprigs . In medium glass bowl, mix cream cheese and goat cheese together. Add pesto in desired amounts, mix with fork to blend. Reserve 4 tablespoons of mixture to form eggs-form into 3-4 egg shapes, chill until ready to serve. Line small bowl with plastic wrap, pack cheese mixture into bowl shape like a nest. Cover and chill at least 2 hours or over night. 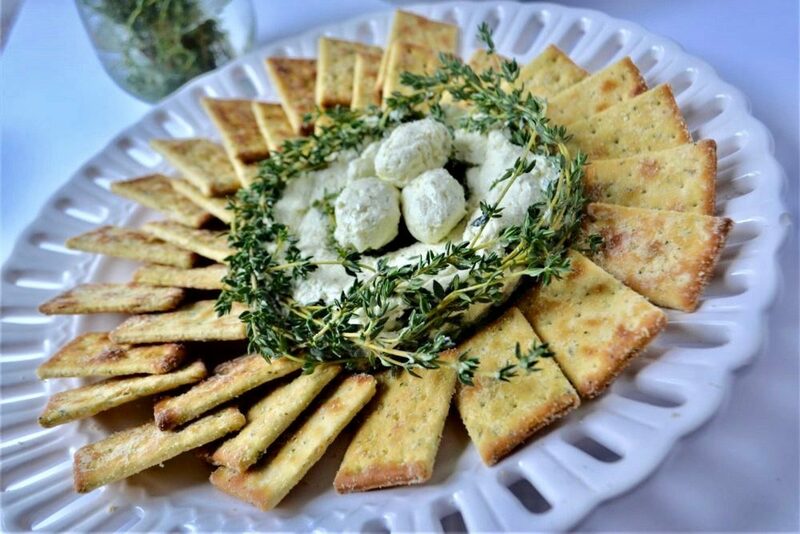 To serve, unwrap cheese, place on serving platter, press thyme sprigs to sides and center of nest. Insert sprigs going in one direction all around the nest to create uniformity and texture. Cut sprigs if necessary to insert into cheese. Add reserved cheese eggs to center of nest, serve with crackers. Store any remaining cheese nest in the refrigerator. To form eggs, spray two spoons with cooking spray and form cheese into the egg shape. Or spray your hands and shape eggs as desired. Wrap in plastic wrap and refrigerate until ready to assemble and serve. Place fresh thyme sprigs in cup of water when you get home from grocery and refrigerate until ready to assemble nest. This will allow the greenery to stay fresh and fragrant.